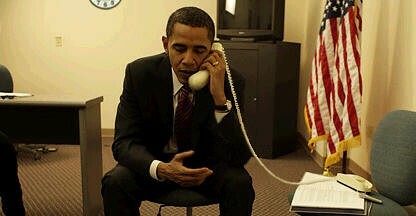 Picture of Barack Obama Holding a Phone Upside Down-Fiction! - Truth or Fiction? 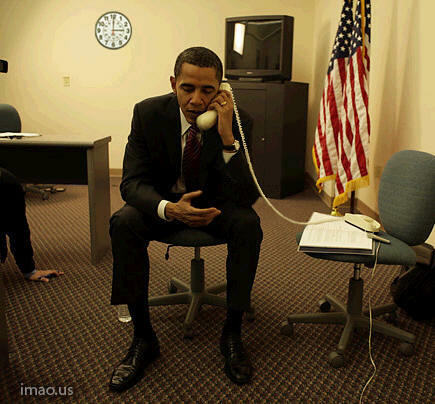 A picture of presidential candidate Senator Barack Obama talking on the phone—but the phone is upside down (Picture is at the bottom of this page). The writer of the email says it was from an Obama photo shoot and implicates that he and his campaign didn’t have the sense to realize what was wrong. The original was posted on Photobucket.com (below). We don’t know when or where it was taken or whether it was posed or candid. Somebody with photo manipulation skills did a good job making it appear as though Obama had it all wrong when he was posing for the picture. Another difference is that in the original picture the wall over Obama’s right shoulder is bare but in the manipulated photo there is a clock on the wall. Subject: Fw: Could be the next President?????? When you are faking a pose for a camera photo opportunity, at least you can get the phone turned in the right direction!